And Fianna Fáil TD Mary O’Rourke denies suggestions Cowen’s comments yesterday have sparked a party heave this morning. BRIAN COWEN’S PARLIAMENTARY party colleagues are reportedly not happy with the revelations made in the Dáil yesterday regarding other guests at a dinner he had with Sean Fitzpatrick. Responding to questions from Sinn Féin TD Caoimhghín Ó Caoláin, Cowen said he and Fitzpatrick were joined by Smurfit Kappa chief executive and former Anglo director Gary McGann, economist Alan Gray, then on the board of Central Bank, and Cowen’s driver. The Taoiseach has insisted matters at Anglo, just months away from collapse, were not discussed. At Leader’s Questions in the Dáil yesterday, Cowen said: “If you were to have a serious discussion on that, you’d have it in the Department of Finance offices”. The Taoiseach also criticised the opposition for what he termed a “patently absurd conspiracy theory” suggesting Anglo had been bailed out by the state because of Fianna Fáil associates who had loans at the bank. Alan Gray has also insisted the bank’s affairs were not discussed. In a statement to RTÉ, Gray said that he had been invited to the dinner to discuss ways to stimulate economic growth and jobs. Speaking on Breakfast on Newstalk this morning, Pat Rabbitte said that the revelations in yesterday’s Dáil session did Cowen damage. Rabbitte said a “shadow hovers over this entire affair” because of the way Cowen has handled the issue, failing to reveal information until pressed by the publication of Fitzpatrick’s claims in a book published last Sunday and by questions in the Dáil. Áine Kerr and Fiach Kelly write in the Irish Independent this morning (see front page of print edition) that Fianna Fáil ministers were outraged after Cowen was shown to have failed to previously provide full details of his contact with Fitzpatrick. We are where we are and we’re so near a general election that it would be futile, I think, to go changing heads. O’Rourke said she thought Cowen spoke openly and fully about the circumstances of the golf meeting. 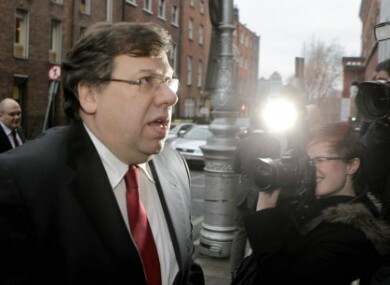 Email “Central Bank's Gray insists Anglo not discussed at Cowen-Fitzpatrick dinner”. Feedback on “Central Bank's Gray insists Anglo not discussed at Cowen-Fitzpatrick dinner”.